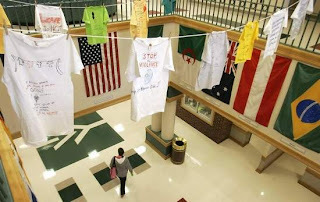 The hand-painted T-shirts communicate silently as they hang above the atrium in Ivy Hall at Ivy Tech Community College. The colorful T-shirts were made by local mothers and children who survived domestic violence. The shirts' creators were served by the YWCA's Domestic Violence Intervention and Prevention Program. A brief ceremony Wednesday at Ivy Tech kicked off the local, monthlong "Clothesline Project" and its T-shirt displays. The project is part of a YWCA effort to raise awareness about violence against women. Other local T-shirt displays are at Indiana Business College and in the Purdue Memorial Union. Last year, 75 women died in Indiana because of domestic violence, said the YWCA's Jasmine Dowd, outreach coordinator of the Domestic Violence Intervention and Prevention Program. "We want to remind those who suffer from domestic violence that they are not alone," she said. A joint proclamation from local governmental officials showed support for survivors of domestic violence. Issuing the proclamation were West Lafayette Mayor John Dennis, Lafayette Clerk Cindy Murray and Tippecanoe County Commissioner Ruth Shedd. "There is nothing more disruptive to a family and a community than domestic violence," said Dennis, a former deputy chief with the Lafayette Police Department.